When the users call, eBay answers! As eBay grew, the need for additional services and software also grew. 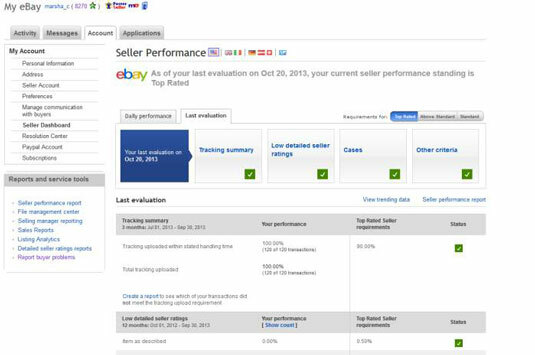 eBay answered the need with Turbo Lister software and its Selling Manager products. Read on to see how these services tailored for the eBay user may benefit you. 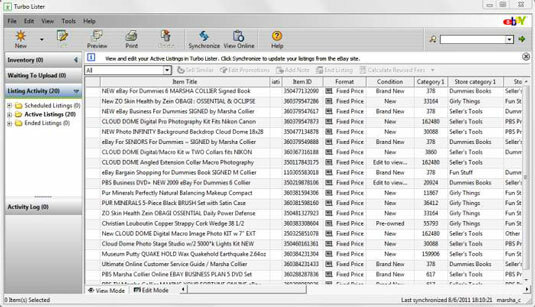 Turbo Lister is free software that enables you to upload many auctions simultaneously. After you prepare your auctions offline, the software uploads your auctions to eBay with just the click of a button. You can edit, preview, and (when you’re ready) launch all your auctions at once, or schedule them to launch at different times. Your items can include eBay’s templates, and the items will remain archived on your computer for later use. The software is convenient and simple to use, even if you have only a few items at one time — although Turbo Lister will let you launch thousands of listings at a time! The program is available as a free download. Listing new items is as easy as making a copy of an older one and filling in new text and photos. Selling Manager Pro is a convenient way to quickly relist singly (or in bulk), track the progress of your sales, send bulk e-mails, leave feedback, and keep track of what has and hasn’t sold. You also get a nice selection of reports to help you keep track of how your listings are performing. This way you can tell whether your sales are on target or not. Selling Manager (or Selling Manager Pro) replaces the All Selling page of My eBay. This thorough data is updated automatically from eBay’s servers and PayPal, so you have up-to-the-minute info. Selling Manager is free to all sellers but you must request the feature. The Pro version, which adds inventory management and reporting features, is tailored to high-volume sellers and costs $15.99 a month, but is free for Premium and Anchor eBay Store subscribers. Be an active eBay member for at least 90 days. Sell a minimum of $3,000 and 100 items with United States buyers in the past 12 months. Maintain at least a 98 feedback percentage. Keep your eBay account current. Comply with all eBay policies. Maintain at least a rating of 4.60 average or higher from U.S. buyers for the past 12 months in all four Detailed Star Ratings (DSRs). Have no more than 1 percent of transactions with low DSRs (1s or 2s) with U.S. buyers on item as described, and a maximum of 2 percent of low DSRs on communication, shipping time, and shipping and handling cost. No more than 0.30 percent of transactions result in closed cases without seller resolution. PowerSeller levels include Bronze, Silver, Gold, Platinum, and Titanium, depending on the number of items you’ve sold or the dollar amount of your sales. You don’t need to apply to be a PowerSeller; just check your Seller Dashboard from your My eBay page, and eBay will have your status on the page. Some listings have the Top Rated Seller icon on them. A rating of Top Rated Seller is hard to attain, but it gives you distinct advantages over the competition. So how do you get Top Rated Seller status? You must earn PowerSeller status first, and meet the requirements shown for Detailed Star Ratings (DSRs). You may also check your status in your Enhanced Seller Dashboard.